B. Matelis also believes that the “Peasant” Seimas group would likely be left by non-partisan members because in the future they will need neither its support, neither its funds in order to participate in the next elections. Another non-partisan group member, Povilas Urbšys did not reject his colleagues’ insights and claimed that the group would have likely fractured already, if signature collection began in support of the now former member of Seimas and group member Greta Kildišienė, who is linked to party leader Ramūnas Karbauskis. G. Kildišienė’s “public relations” campaign placed a wedge? The Seimas' corridors are rife with talk that upon breaking away from the mother “Peasant” group, the new group would not enter the opposition, but rather would support the cabinet of Saulius Skvernelis. 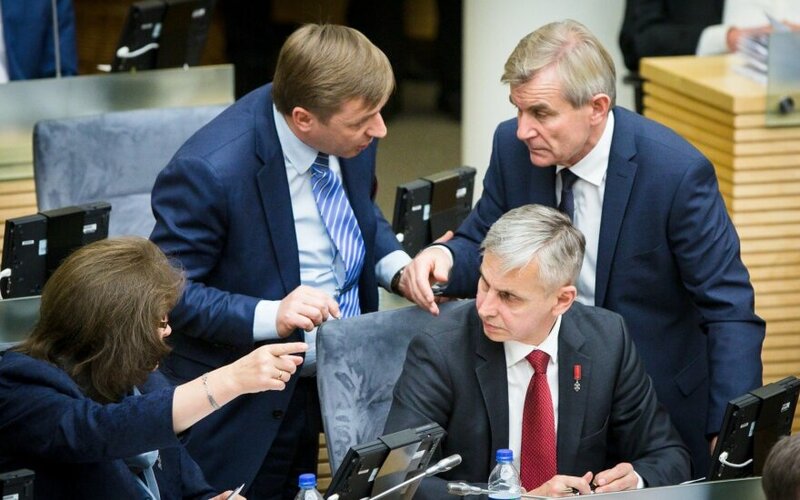 This is not denied by the “Peasants” themselves during private discussions, they explain that the core of the new Seimas group could be formed by supporters of the Prime Minister, in other terms the people who followed him into the “Peasant” ranks prior to the Seimas elections. “At the time when G. Kildišienė‘s story was developing and some fraction members took initiative to shield her, gather signatures and practically request that she would not relinquish her mandate, there were many opinions in the group as to how to react to it. I will not hide that there were discussions of those who are not in support of such a “public relations” campaign to potentially depart the Seimas group and form a new one, while still supporting the government programme and the “Peasant” electoral proposals. Currently, however, this question is not being discussed,” Urbšys said. G. Kildišienė‘s withdrawal from Seimas apparently resolved the various problems that arose and while a certain division has emerged in the group, there is no hostility. According to P. Urbšys everyone felt the limits that should not be exceeded. He also assured that there is no mistrust between S. Skvernelis and R. Karbauskis. “Karbauskis does not believe that S. Skvernelis and his followers could have contributed to the initiation of those scandals,” he noted. Dovilė Šakalienė is seen as a potential rebel. She has been “rebelling” since the beginning of work at Seimas. “But I am still hanging on. The “Peasants” are the axis of the coalition government and have made commitments to me to accomplish social policy objectives that I placed into their electoral programme. Despite all the struggles and withdrawals they are now trying to accomplish it. I received the signatures of Rima Baškienė and R. Karbauskis. As such I am rather unwilling to depart. When the legislation necessary for children’s rights protection and other social affairs is passed, then we can all come to terms and do whatever they want,” Šakalienė said. There are talks that the petition was initiated by young “Peasant” representatives elected in Kaunas. “This is all unexpected to me and I know nothing of such plans,” Seimas vice Speaker, “Peasant” Rima Baškienė assured. She stated that the group is poised for serious work – last week featured two hearings during which there were discussions on the regions, forests, postal service reform and the group will resume discussions this week. “Perhaps our opponents would prefer and find it interesting (if the group fractured – LRT.lt), but I do not believe it will happen,” Baškienė reaffirmed. Meanwhile the “Peasant” leader has once again walled himself off with silence, it has been impossible to reach him as of late. V. Bakas does, however, point out that the group will face its greatest challenges March and April when the Seimas will debate education, forestry and state governance reform. If, according to him, they are passed smoothly, then no fracturing can be expected. If it were to fail things could be different.